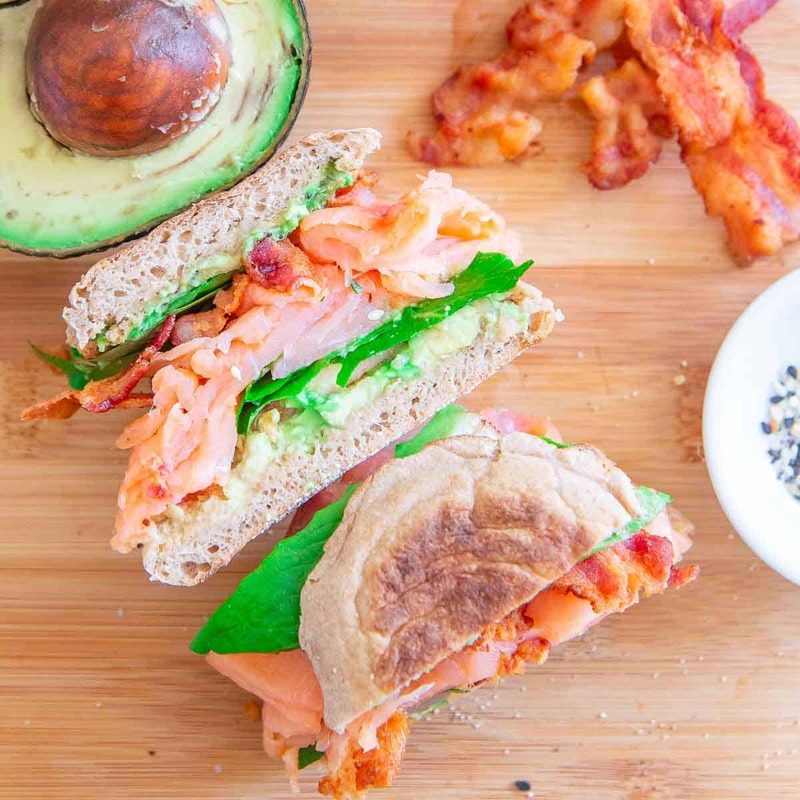 This smoked salmon BLT with avocado and everything bagel seasoning is the ultimate weekend breakfast, brunch or lunch. A delicious and more satisfying way to enjoy a BLT! It wasn’t until recently that I started liking smoked salmon. It was a taste preference (or lack thereof I guess) that baffled me because I absolutely love actual non-smoked salmon. It’s probably my favorite, go-to fish for easy oven dinners like sriracha honey salmon vegetable packs or tart cherry glazed salmon and to be honest, it really annoyed me that I couldn’t force myself to enjoy smoked salmon. It wasn’t for lack of trying either and while it wasn’t a full out hatred of it, I just didn’t love it like I wanted to. Something changed over the last year though. I’m pretty sure it started with this amazingly epic smoked salmon cream cheese bagel from a deli called chatzpuh in Virginia when I visited Julie last year and continued when I found the smoked salmon trio from Trader Joes a couple weeks later (the black pepper flavor is my favorite). Slowly, I became a smoked salmon person. And now that that goal has finally been realized in my life, I’m making up for lost time by eating smoked salmon just about any way I can. Like this smashed avocado smoked salmon BLT. I guess I could really call it a smoked salmon BLAT but that acronym just makes me cringe a little. I’d normally go over how to make this smoked salmon BLT like any other recipe but really, it’s a freakin’ BLT. I don’t think it really needs much explanation. I personally like eating this sandwich on an English muffin but any bread will do. I’m imagining a nice pumpernickel to let the gorgeous pink salmon shine in between but that’s probably just the food blogger in me wanting to take a pretty picture. 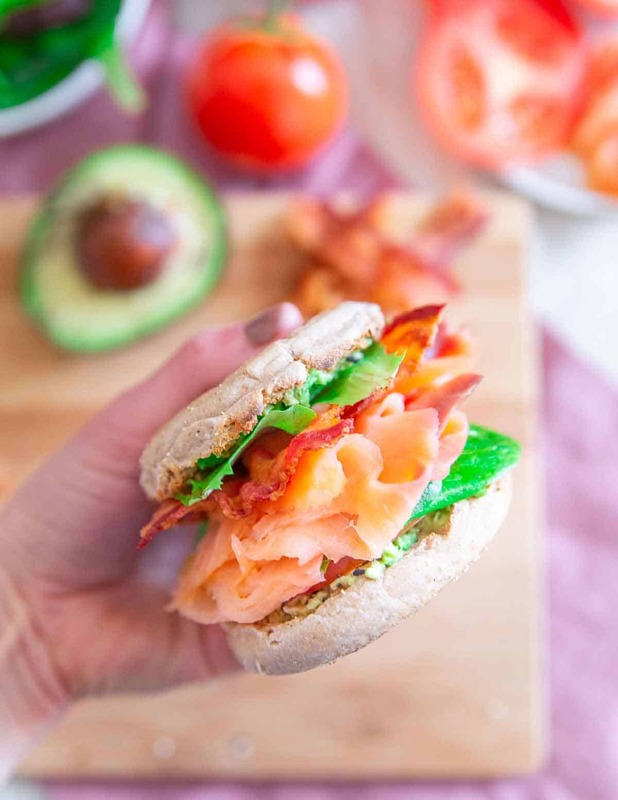 The one “secret” ingredient in this salmon BLT is the everything bagel seasoning sprinkled on top of the smashed avocado. It’s basically like adding avocado toast to your BLT and I can’t think of any reason not to like that. While I love BLTs, eaten as they’re originally intended (with just bacon, lettuce and tomato) is a bit lacking for me. It’s why I added cheese to this summer BLTC sandwich and one of the reasons I love the smoked salmon in this version. Besides flavor, the salmon also adds a good dose of healthy fats and protein making it a much more satisfying and filling meal than the classic. I know traditionally BLTs include mayo but I think the smashed avocado is not only a healthier choice, it’s a much more flavorful and filling one too. Oh, and one more thing about BLTs: the bacon must be crispy! No chewy, soggy bacon allowed. It’s a texture thing and even more important when combined with the smoked salmon to have that crispy crunch from the bacon otherwise, things can be a bit “soft” for lack of a better word in this sandwich. If you’re wondering if this would be better suited for breakfast or lunch, I can tell you I’ve done both. 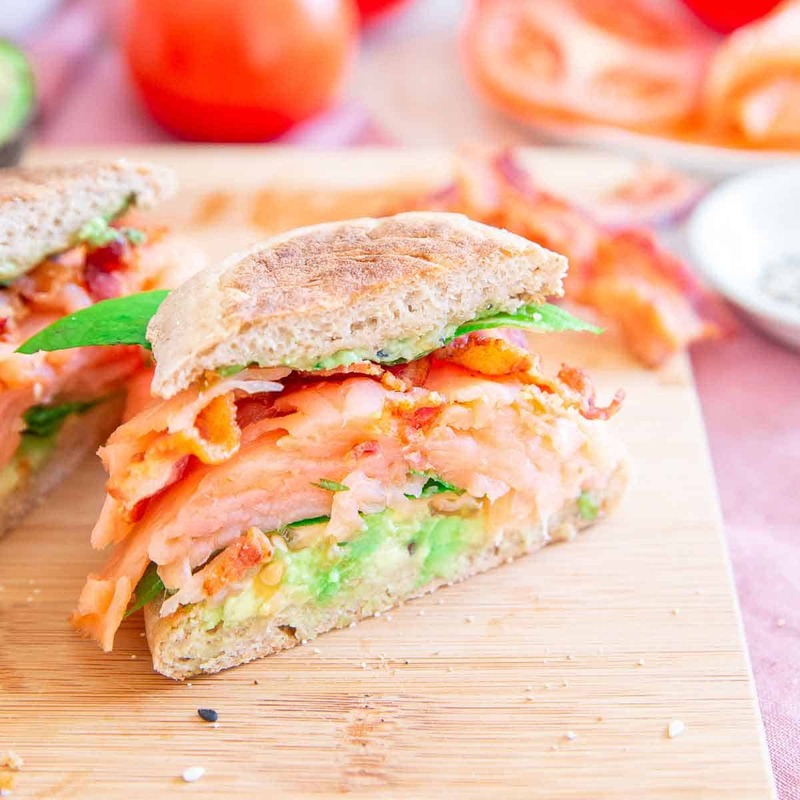 I love this smoked salmon BLT sandwich as breakfast (you could even add a fried egg on top! ), just as much as I do lunch. It also makes an excellent brunch choice paired with a good bloody Mary (this homemade V8 juice makes a great base for one of those!) and would be perfect for any upcoming Mother’s Day festivities if you do the brunch thing for that. Maybe with some mini lemon thyme cheesecakes for dessert? Feel free to also substitute lox (salt-brined salmon vs. smoked) instead of smoked salmon in this BLT if you prefer that. Or, if you’re like me from a year ago and can’t really get down with the whole smoked salmon thing, use some cooked salmon! A simple oven-baked filet would work just as well and make an equally delicious salmon BLT. Looking for more sandwiches like this salmon BLAT? 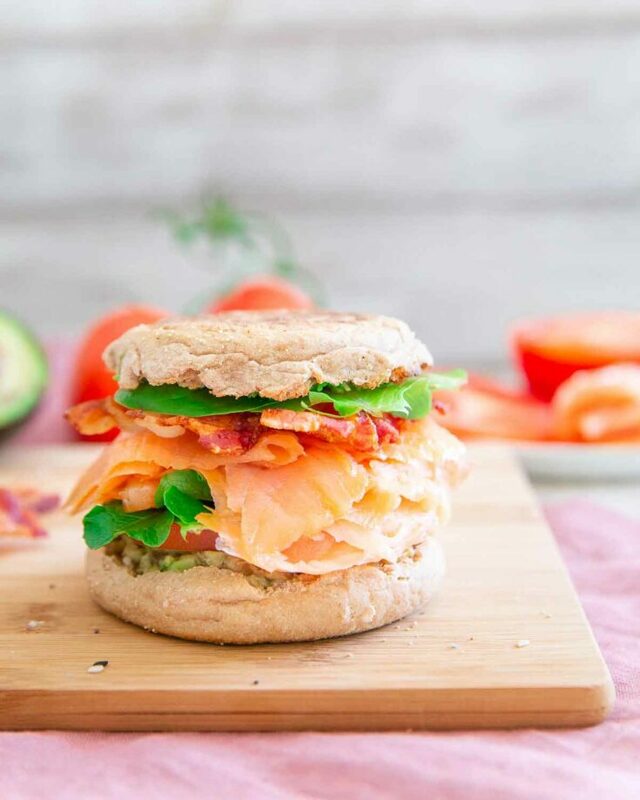 This smoked salmon BLT with avocado and everything bagel seasoning is the ultimate weekend breakfast or brunch. Pair with a good Bloody Mary and enjoy! Smash the avocado on each slice of the English muffin, sprinkle everything bagel seasoning on top. Place the tomato slice on top of the avocado on the base slice of the English muffin. Place half the lettuce greens on top of the tomato. Fold salmon slices on top of the greens. Top salmon with bacon, remaining lettuce greens and then the top of the English muffin. *Use gluten-free English muffin if necessary. I LOVE anything smoked salmon!!! It is possibly my favorite food ever. (my kids are big fans too….having been served it from being tiny!) So I knew I had to try this! MAN was it good! Just the right balance of everything and perfect for brunch this weekend. Can you replace the avocado with something else, I cannot eat avocado. Thank you. You could use hummus or just leave it off entirely.